After spending nearly 40 years in the service of the international community, much of it as a leader in peace operations, in the field and in headquarters. Ameerah will discuss how, during these assignments, she experienced that women and girls often bear the burden of conflict, how they can help build peace and stability, and how difficult it has been for societies, organizations and the international community to value, respect and integrate the female perspective. Ms. Ameerah Haq is the former UN Under-Secretary-General for the Department of Field Support (2012 to 2014). She most recently served as the Vice Chair of the High-Level Independent Panel on Peace Operations for the United Nations (UN) . She has over 39 years of UN experience, including 19 years of field experience. She was the last Special Representative of the Secretary-General (SRSG) in the UN Integrated Mission in East Timor. She has also held the positions of Deputy SRSG and UN Resident Coordinator in Sudan, as well as Deputy SRSG and UN Resident Coordinator in Afghanistan. 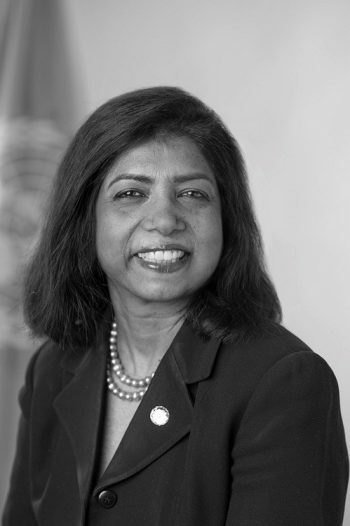 In addition, Ms. Haq has held senior positions within the UN Development Programme and has served as UN Resident Coordinator in Malaysia and Laos. She currently serves on the Board for the Centre for Humanitarian Dialogue, on the Secretary-General’s Senior Expert Group on Human Rights Up Front, and the Center for International Peace Operations zif, Berlin.